Two spectacular engraving bird’s-eye-view pictorial maps, showing physical features—buildings, trees, trains, trolleys, horses, people. One looking from lower Main Street, the waterfront, DL&W depot—now NFTA Metro rapid rail transit barns—from the year 1895. The other entitled “The Park, Buffalo, N.Y.: Delaware Park, Lots for Sale,” from 1891. Delaware Park in the foreground, looking north, past the beltline rail line and Hertel Avenue, into Kenmore. Mostly farms north of the park and few scattered houses. But “Delaware Park” is not current Delaware Park. That’s just “The Park.” The “Delaware Park” of the map title is a rectangular territory east of Delaware Avenue, between the beltline and Hertel, extending toward but not all the way to Colvin. This is a prospective sales map. The territory in question is divided into lots on the market. The main selling point, however, is clearly the proximity to the real park. Which looks wonderful without the subsequent expressway disfigurement. The map shows a portion of Humboldt Parkway, before its transformation to an expressway, and a portion of Lincoln Parkway, pretty much as it is today. (But hey, the people on Lincoln Parkway were white. The people on Humboldt Parkway were more and more in the early 1960s black.) Based on the map, Humboldt Parkway was more of a parkway—as wide or wider and more tree-lined—than Lincoln. An 1893 map from the Christian Homestead Association of Buffalo (devoted to serving “the unfortunate and erring through mission work”) shows the location of each of the 120 saloons and 75 houses of ill fame in the few blocks area of Canal Town now occupied by the Marine Drive high rise apartments and the Naval and Military Park. A map for newcomers to the area, maybe, pointing out the amenities. Various other historical maps. 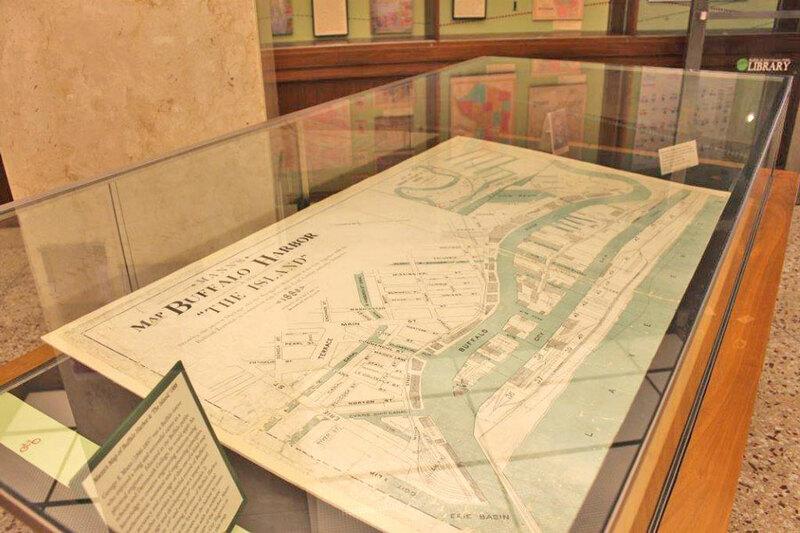 A 1907 map of downtown and the canals and waterfront when what we know as the Erie Basin Marina—the land, not the water—was an island. 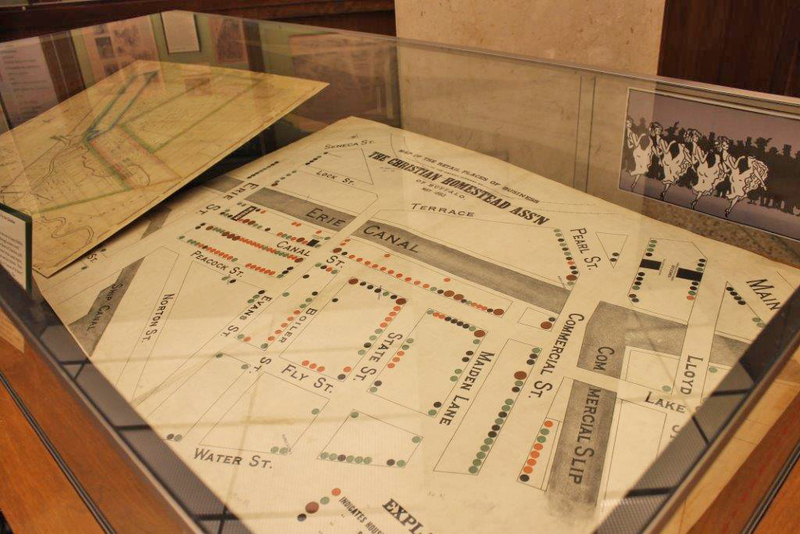 Showing the Union Passenger Station (accommodating the New York Central and half dozen or so other railroads) and Erie Passenger Station and Lehigh Valley Station stood cheek by jowl where the Buffalo News building now stands. Another map of Buffalo Harbor and The Island—that is, Ganson Street milling district—shows the extensive Lehigh Valley slips and docks complex in the Tifft Farm area. In a piece a couple of weeks ago I quoted Henry Reed’s statement that “maps are of time, not place.” I should have kept it for this one.